Right after launching the new PadFone Infinity, Asus has also unveiled yet another new product at its MWC 2013 media conference that the company called as the FonePad. While the name might give an impression that the company has reversed PadFone’s form in order to come out with another new hybrid device, the reality is actually much simpler than that as the new Asus FonePad is essentially a 3G-enabled Android 4.1 Jelly Bean tablet with telephony ability. With that, users are able to answer a phone call right on the tablet via its noise-cancelling digital microphone (just like any ordinary phones) or through any Bluetooth headset. True enough, it is not the first such device in the market but on another hand, the Asus FonePad is actually powered by an Intel Atom Z2420 processor which features a single-core 1.20GHz CPU with Intel HyperThreading technology together with PowerVR SGX540 as its GPU. Alongside the processor are 1GB worth of RAM and internal storage of either 8GB or 16GB that can be supplemented through the tablet’s microSD slot that supports card with storage of up to 32GB. 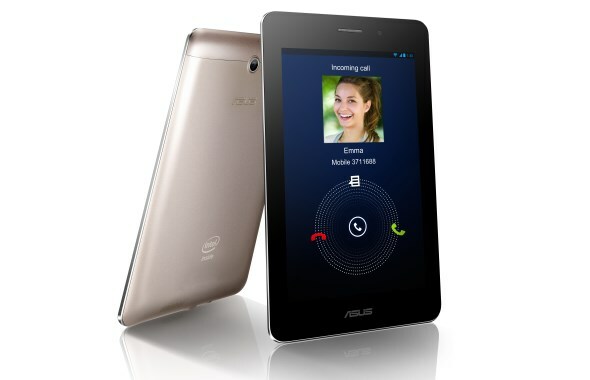 The Asus FonePad also features a 7-inch IPS display with 1280×800 resolution together with a 1.2-megapixels front-facing camera. Last but not least, the new Asus FonePad also comes with a 4270mAh battery that provides up to 9 hours of battery life to the device. The tablet will be released throughout the world starting from March onwards with a price tag of RM 772 (USD 249) for customers in APEC which will receive the 8GB model with additional 3-megapixels rear camera. On another hand, the tablet will cost less in Europe at RM 679 (EUR 219) and will be equipped with the higher 16GB storage capacity but will be missing the rear camera unlike its APEC counterpart. 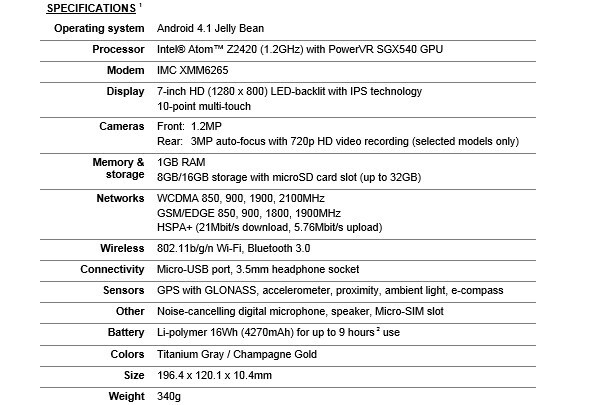 Click on the Read More link below to check out the tablet’s full specifications.